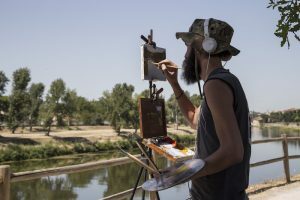 The European School of Economics (ESE) and The Florence Academy of Art (FAA) have come together to forge a partnership to offer students who are interested in business and visual arts a truly unique learning experience. During this 4-week summer intensive program students will learn about the creative as well as the business aspects of art, along with skills to be able to competently approach both subjects. During the first week of school, ESE & FAA will welcome students during an evening garden party at the Budini Gattai Palace. On Saturdays, students will take inspiration from the masterpieces around them by exploring museums and galleries in Florence during guided museum visits to the Uffizi Gallery, the Accademia, Bargello Sculpture Museum, and the Pitti Palace. The university credits that students will earn upon completion of the FAA Fine Arts workshop are accredited by the National Association of Schools of Art and Design (NASAD). To apply, please use the online application form on this page. 60 hours full instruction in English, all with the model, by individual critique. Maximum enrollment 14 students. Two students per portrait model. Simone Olivia Moritz was born in Prien am Chiemssee, Germany in 1985. Her family always had a great interest in art, and her humanistic education has been of significant influence on her. She soon felt a strong desire to become a professional painter and has continuously pursued this goal. After finishing her diploma in Art and Latin she worked for two years as an assistant in a painter’s studio while doing freelance commissions. In 2006 she enrolled at The Florence Academy of Art to deepen her studies and achieve the tools needed to express herself as an artist. She has been teaching at the Academy since 2009. Her work has been shown in several group and solo shows and is in private collections throughout Europe and the United States. Nicholas Chaundy is a contemporary portrait artist and figurative painter based in Bristol. He is a graduate of the Florence Academy of Art, Falmouth University and Central St Martins. Nicholas first studied art at Central St Martins where he received his Foundation Diploma in Fine Arts and then moved to Falmouth, Cornwall to study Fine Arts at Falmouth University. Here, having received no prior formal training Nicholas used the three-year programme to fully immerse himself in the world of fine art, reading about, practicing and discovering the techniques of traditional painting and drawing that had been used for hundreds of years. After graduating, he moved to Bristol to start working as a portrait painter. He then moved to Florence to study at the prestigious Florence Academy of Art. Here he went on to further his understanding of nineteenth century techniques in portraiture, figurative and still life work. Whilst studying at the Florence Academy Nicholas received a scholarship and completed the three-year programme in just over two years. Toby Neve is a British painter born in 1993 whose specialised education in drawing and painting began in 2011 at the London Atelier of Representational Art, before he joined The Florence Academy of Art in 2012. Upon graduating in 2015, and having started teaching as an student-instructor in his third year of studies, he was awarded the Fourth-Year prize, working for a year under Daniel Graves, next-door to his private studio. Toby teaches drawing and painting in the First and Second year programs and gives lectures on the materials of drawing and painting. He works in a private studio space on the FAA campus, which students are welcome to visit out of working hours. He was awarded a first place ARC scholarship in 2014 and was a 2015 Hudson River Fellow. Minimum enrollment requirement for all studio workshops is 5. Students will be notified if this number is not reached 60 days before the first day of class. At that time, they will be given the choice of either enrolling in another workshop, availability permitting, or having their payment refunded. Students may continue to apply to workshops even after the deadline and through the first day of the course. 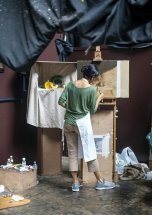 The Florence Academy of Art reserves the right to substitute instructors of any course at the last minute or during the session. Once you apply and are accepted, you will receive an acceptance packet via email with information on housing, materials and payment of the non-refundable deposit due immediately to hold your place. The balance must be received on May 1. No refunds will be given for cancellation after payment of the balance. At The Florence Academy of Art, skill in drawing is considered fundamental to perfection in painting, sculpture or other art form. This course is designed to strengthen the student’s visual relationship with three-dimensional form, allowing you to confront the human figure, and eventually to paint or sculpt with accuracy. 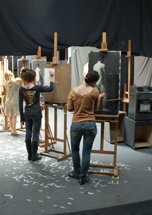 Students are introduced to the academic method of figure drawing, employed by the major Realist ateliers of 19th century Paris, best exemplified by Jean Léon Gérôme and the French Academic tradition. They are taught to use the sight-size method of measurement, which trains the eye to view the subject with accuracy in order to reproduce it successfully. 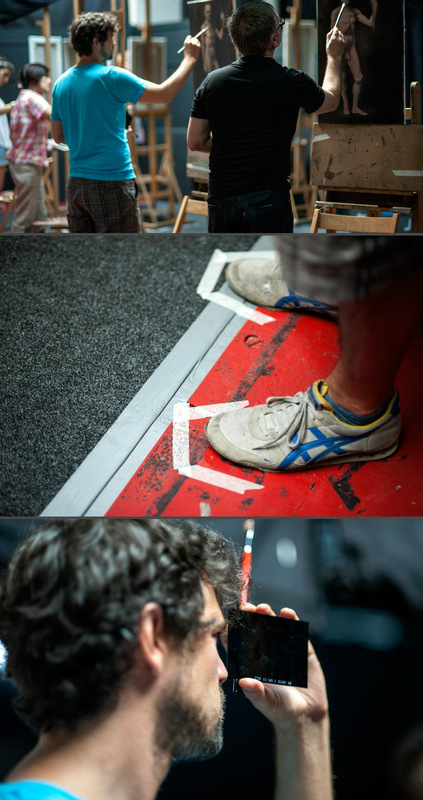 Throughout the course, students apply this method of measurement to the human figure. For the first week, students learn to draw from plaster casts of antique and Renaissance statues, focusing on outline, proportion, and shadow shape. From the second week through the end of the course, they work from the live model everyday for 3 hours per day on two long poses: one using charcoal on white paper, and the other on toned paper with charcoal and white chalk. Students receive daily individual critiques to help guide them toward a fully resolved and accurate drawing. Students will be working with oil paint, and will be guided through the process of making an oil painting from start to finish. There will be an introduction on a variety of materials available and the ways that they can be used. Students will be taught to use the sight-size method of measurement that trains the eye to view the subject with accuracy in order to reproduce it successfully. Throughout the course, students apply this method of measurement to the human figure. 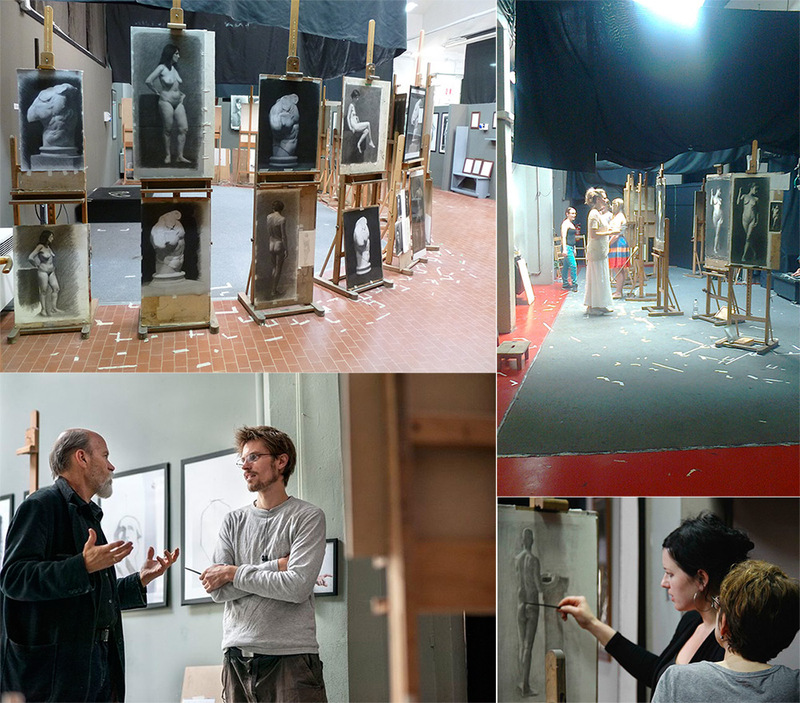 The class will work on one long pose, focusing on structure, proportion, edge quality, light impression and atmosphere. 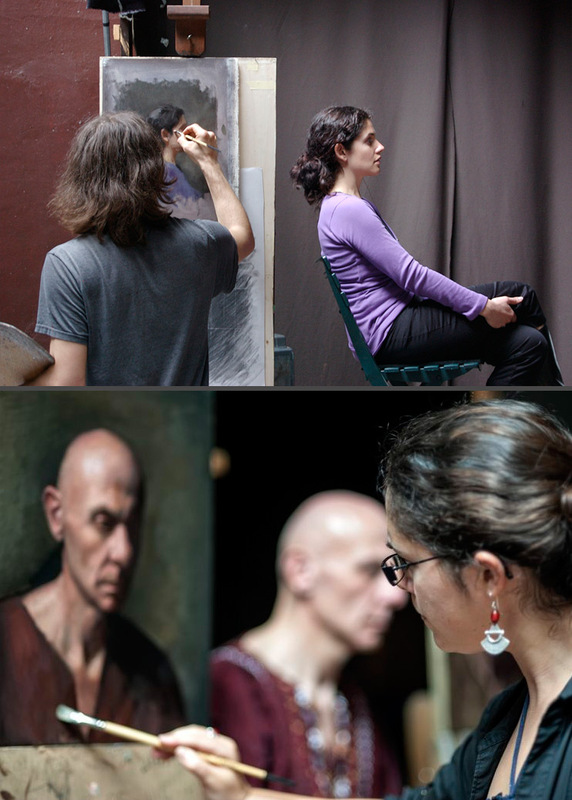 Students will receive daily individual critiques to help guide them towards a fully resolved and accurate painting. Portrait anatomy and structure are studied from various points of view, with particular attention paid to the anatomical construction of its parts, ear, eye, nose and mouth. 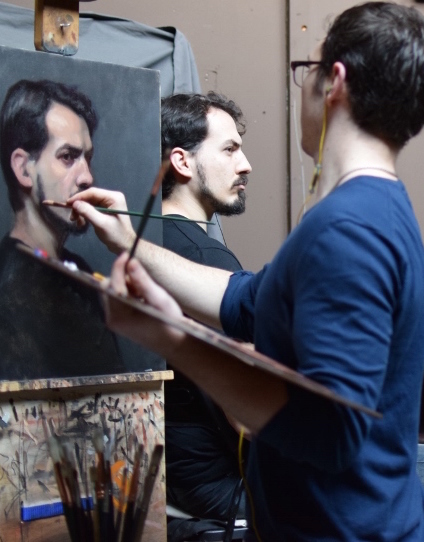 Two students work around one model from a variety of viewpoints: profile, full front, three-quarter, reconstructing both the anatomy and the psychology of the sitter. Here the study of expression is undertaken to convey mood and personality. Students may choose to work in charcoal or oil. Vitaliy Shtanko was born in 1979 in the Ukraine. He studied at Drogobych Art School from 1990-1994, then attended Lvov Academy where he studied classical drawing and painting until 1999. 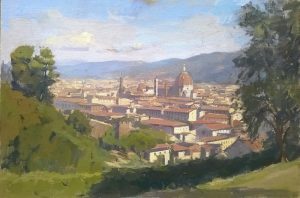 In 2000, Vitaliy moved to Florence with his family where he continued to study classical painting techniques with Daniel Graves at The Florence Academy of Art. After gradauting from the Painting Program in 2010, Vitaliy was offered a position of Principal Instructor in the drawing and painting programs. Simple objects are made transcendent by exquisite stagecraft and technique. Still life painting is a unique genre in its own right with a long history of richness and variety as well as being a training ground for other forms of painting. The workshop covers the issues of composition, drawing, values and color through the vehicle of making a modest scale still life painting in oil. Studies are executed in both charcoal and oil paint. 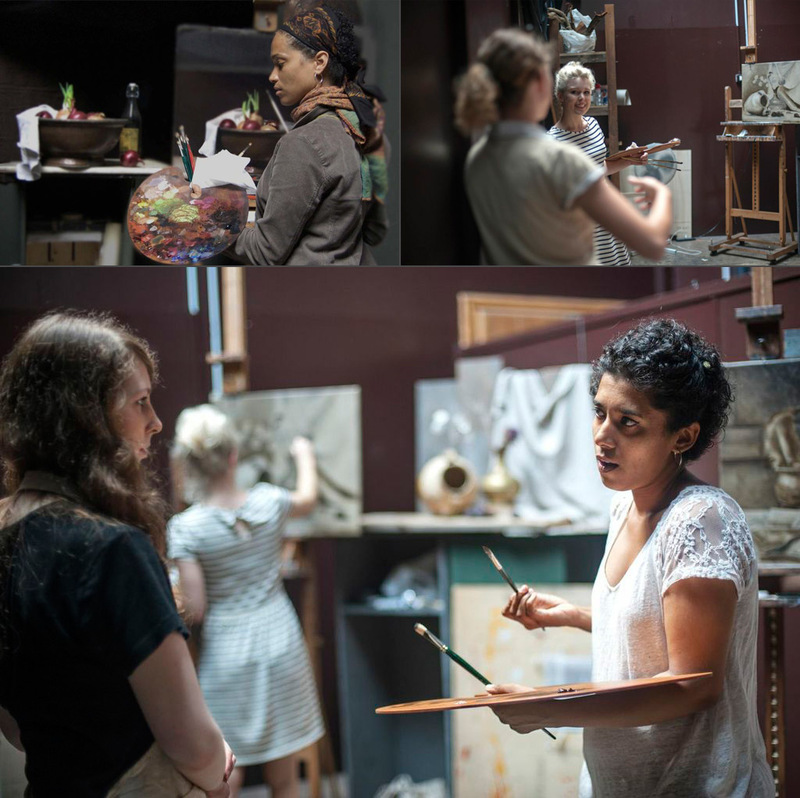 Students work in an environment of natural north light, utilizing the methodology of The Florence Academy to create a uniquely individual Still Life developed in a step by step approach: selection of material, composition, charcoal sketches, value and color studies, preliminary painting and final paintings. Students also learn about supports for painting, pigment selection and the fundamentals of color mixing, the use of mediums, the sight-size method of drawing, and the use of basic tools for drawing and painting. Aside from general information, all instruction and critiques will be on an individual basis. Maureen Hyde’s interest in visual stories dates back to her childhood, and ultimately led to an MFA at the University of California at Los Angeles, and a career in book illustration. 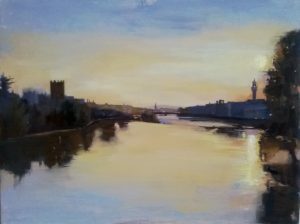 However, she followed her fascination with the beautiful rhythms of light on form to The Florence Academy of Art where she is now a principle instructor in the Intensive Drawing and Painting Programs. Beginning, intermediate and advanced students of sculpture are welcome to join this intensive course in Figurative Sculpture, designed to further develop the student’s ability and understanding of human form and the structure of the human body. Exercises are tailored to meet the various levels represented by students in the class. Students spend one week studying the structure of the head, working on a human skull in clay. This prepares them for sculpting from life a life-size portrait and a 1/2 life-size figure. 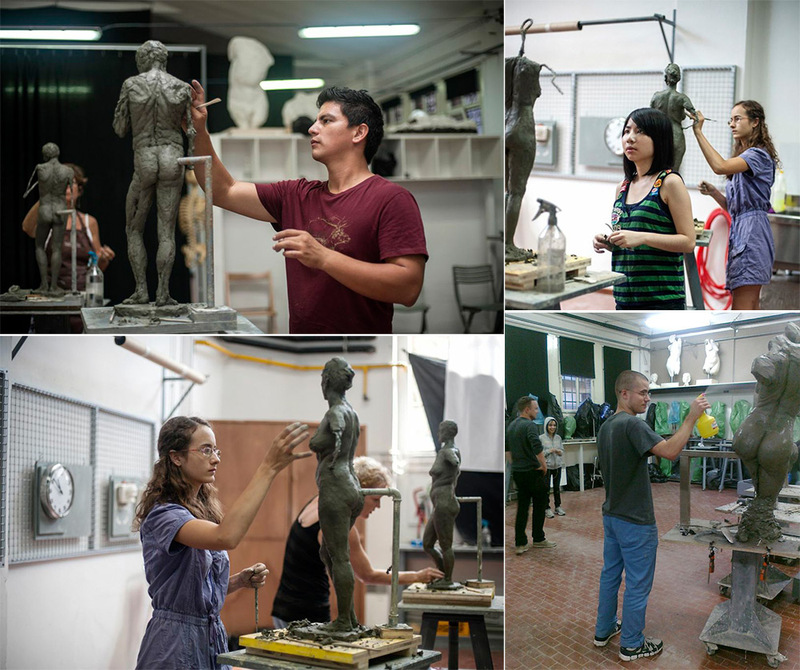 During the fourth week, students learn to cast with rubber/silicone. Each student casts one piece. Students applying to sculpture may send two or three examples of their work in the form of low resolution jpegs to: info@florenceacademyofart.com. These will be viewed by faculty to understand the student’s level of experience. Eran Webber grew up in an artistic environment on a kibbutz on the Carmel Coast of Israel. His artistic training began in high school and at evening courses in Tel Aviv. In 2007, he moved to Italy to study the fundamentals of classical figurative art and began sculpting at the Accademia di Belle Arti. Later that year, Webber was accepted into The Florence Academy of Art’s Sculpture Program and graduated in 2010. He was on faculty at the academy from 2010 until 2013 as the Principal Instructor of the Sculpture Program. Webber has taught workshops in Italy, Israel, and the United States, has exhibited internationally. His work can be found in private collections throughout Europe and the United States, and he is represented by Galerie Michael, in Beverly Hills, California. Webber is currently living and working in his sculpture studio in Israel, on the same kibbutz where he was born. 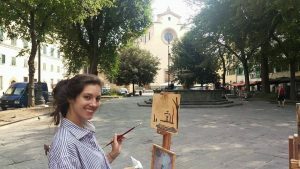 With Florence as its backdrop, the summer landscape painting course brings students to the square’s, gardens and surrounding hillsides of one of the world’s most picturesque and beautiful cities. 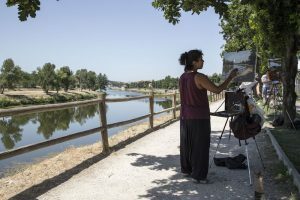 The academy’s expert instructors guide students through the practical concepts and artistic process of landscape art. 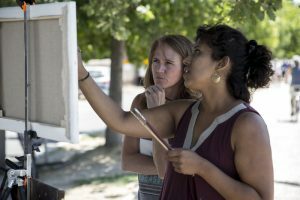 Painting 2 – 5 days in each setting, students learn to observe and record directly from nature, confront the perspective of monuments, and reproduce the landscape’s structural rhythms and design. 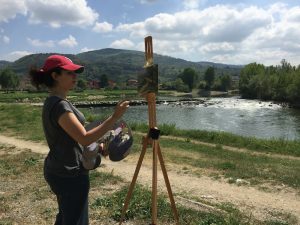 They learn how to select a motif and create a composition, as well as basic information on the plein air oil painting process: finding and mixing color values, organizing the palette, and applying paint. Tanvi Pathare, born in Mumbai, India, showed a growing interest in the fine arts since a very early age. She graduated with honors from the prestigious Sir J. J. School of Art in Mumbai where she received a Bachelors of Fine Arts in Painting. 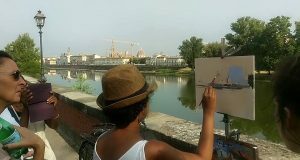 Following the allure of the realistic tradition of painting from nature, Tanvi attended The Florence Academy of Art, Florence, Italy, graduating from the Painting Program in 2012. During her second year, she won the award for Best Figure Painting in the Intermediate Program, and in her final year, she was awarded Honorable Mention for Exceptional Overall Performance in Advanced Painting. She is recipient of the prestigious Elizabeth Greenshields Foundation Grant for Painting (2012), and a finalist in the Figurative Category of the ARC International Salon 2012-2013. 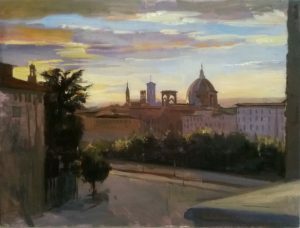 Tanvi began teaching at The Florence Academy of Art as a student, and is presently a principal instructor in the Intensive Drawing and Painting programs at The Florence Academy of Art. She works privately in Florence.